CircuitLab now supports parameterized circuits, allowing you to define variables and have one or more circuit elements depend on those values. To add a parameter, find the "Parameter Element" in the toolbox, and set a name equal to a value. For example, "Rsrc" = "500" to create a variable with name Rsrc and value 500. 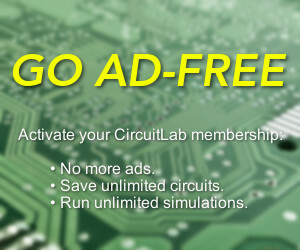 You can subsequently reference the name Rsrc in any circuit elements you wish, and before running the simulation, the CircuitLab engine will compute and replace the parameter for you. These sheet-wide parameters can include calculations, and can even reference each other. In effect, we've built a programming language layer to give you more control of your simulations! This powerful feature can be used to drive simulations, sweeping multiple related values simultaneously, and can even calculate useful component values for you. Open and run the simulations to see the gain-bandwidth tradeoff and the calculated resistor values! Open and run the simulations to see the narrowband power transfer maximum across frequency and the calculated capacitor and inductor values! We hope you'll enjoy this powerful capability and push your simulations to the next level. Now that is a major step forwards! This is a great feature, I need MatLab/simulink less and less these days.